Our beloved Donald Burrisk, age 66, was called to our Heavenly Father on Monday, December 10, 2018. He was preceded in death by his parents, Pete Henry, Jr. and Martha Jane Burrisk and grandparents, Pete Henry, Sr. and Mary Lou Burrisk and John Christian and Willie Bell Ermel. Don is survived by his loving wife of 37 years, Rebecca Villaseñor Burrisk; his brothers, David Burrisk, Steven Burrisk and his wife, Sherri, and Mark Burrisk; his brother-in-law, Charles Villaseñor; sister-in-law, Melissa Villaseñor; aunts Geneva Ermel, Sandra Burrisk White, and Linda Burrisk Honeycutt; nieces and nephews, Jon Burrisk, Kimberly Ott, Ashley Oliva, Charlie Dye, and Spencer Dye, and numerous other loving family members and friends. 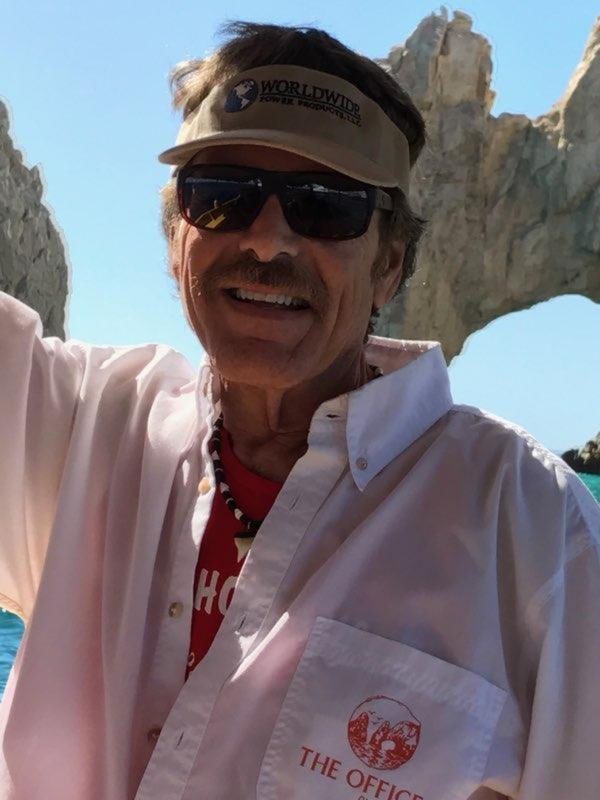 Don is a proud University of Texas alumni and Longhorn footballer, graduating in 1974 with a Bachelor's degree in journalism. He married the love of his life in 1981 and they settled in Houston, Texas. Don enjoyed a long career in commercial real estate before a battle with cancer that he fought with valor. He had a great sense of humor and was a wonderful friend. He will be greatly missed. Visitation will begin at 5:00 p.m., with Words of Comfort beginning at 7:00 p.m., Monday, December 17, 2018, at Mission Funeral Home - South Side, 6204 S. First St., Austin, Texas. A Funeral Service will begin at 10:00 a.m. on Tuesday, December 18, 2018, at Mission Funeral Home - South Side. A reception will follow the funeral service. Augie Garrido said "life doesn't give us what we pray for. It doesn't give us what we wish for. It doesn't give us anything other than opportunity, nothing more, nothing less, and that's enough. In fact, it is a great gift." Don Burrisk understood Augie’s quote and made the most of his opportunities. We have lost a special person this week, but I know by faith alone that Don’s spirit can now celebrate for eternity a lifetime filled with fellowship, friendships, and a loving family freed from the ravages of cancer. For Don, Mark Halfmann’s ranch was a safe haven. A port in the storm that allowed him to enjoy the present without dwelling on the past and dealing with the future. It was a time when friendships and fellowship took precedence over his struggle to defeat cancer. Don was in his “zone” at the reunion. Mark, Don, and Bill committed to helping Dennis a teammate in a dark period of his life. Adrian Ford - Don was always a good friend and one of the best story tellers I have ever been around. Dan Adams agrees with Adrian and Mark Halfmann. 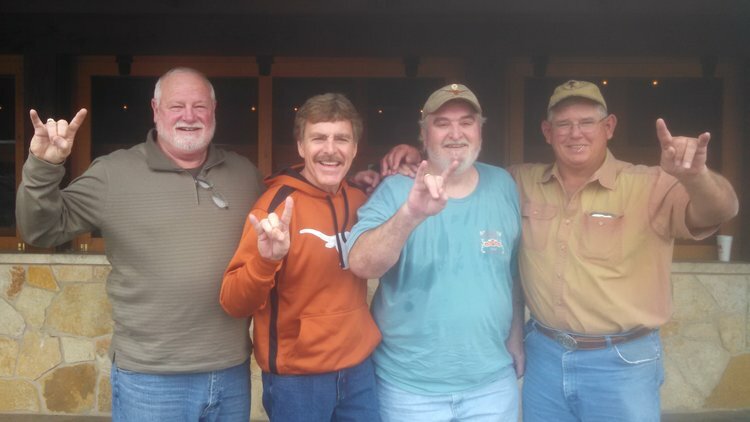 Dan says "If there was a Longhorn event, you knew Don was going to be there. He was always a good friend to his teammates and anyone he ever met was never a stranger for very long. He was never at a loss of words and was one of the best story tellers any of us have ever known." Fred Schon- Don Burrisk was one of my first High School Heros. He put our school Aldine on the Texas Football map. Almost everything I've been saying about Don the last few days is about football. That was Don Burrisk ....A Football Legend period. He was a gentleman even as a young man at Aldine. He was kind and spoke poltely to everyone. I never saw him when he wasn't smiling unless it was when he was carrying the football and dragging 1 or 2 opponents towards the goal line with him. You have reached your goal line my friend and we who knew you are all winners .RIP MR. ALDINE #25 ..
Billy Dale -There is a saying that to have a friend you must first be a friend. Don had many friends. These friendships lasted during his lifetime and are now part of his spirit for eternity. Horns up! Hap and Zoe- There are no words that will make a difference but hopefully the love you know we have for you will bring you some peace. Hap & Zoe . Randy Robertson posted a condolence Friday, December 14, 2018- I have known Don since the 1st grade and have kept in touch with him for sum 60 years. The world has lost a truly great individual and I am truly lucky to have known him for all these years. There are no words to describe the loss that his family and friends are dealing with at this time but considering the process he had been going through for some time he is in a better place in the arms of our Lord. I pray for his wife Becky and all of the family and I cherish all of the moments that he and I have shared. Cheryle Byrd posted a condolence Saturday, December 15, 2018- Don was a wonderful guy, loved by everyone. We dated through high school and he was the perfect boyfriend. But as always things come to an end. He went off to college and met the true love of his life and she became his wife. Three years ago almost to the date we had a Christmas party at our home and had several of our high school friends over. Don and Becky came. We all had a wonderful time and as always he was the life of Party. That was the last time we saw him. It is hard to believe he is passed on, but he is with the Lord now and no more suffering. One day we will all be united and what a day that will be. Heaven received a great guy.